Butterscotch | Baking and Caking! It’s officially fall and you know what that means? PUMPKIN SEASON! There are few things I enjoy more in life than pumpkin-inspired baked goods so you can imagine my delight when stores start stocking pumpkin purée and farmers’ markets have baskets full of sugar pumpkins and assorted squash! 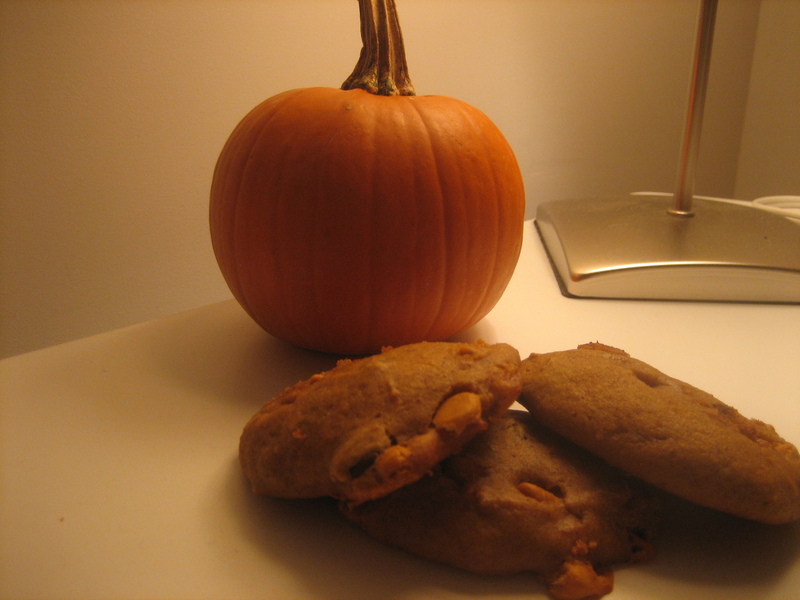 I decided to kick off my pumpkin habit this year with some pumpkin cookies that have a kick of chocolate and butterscotch in them. 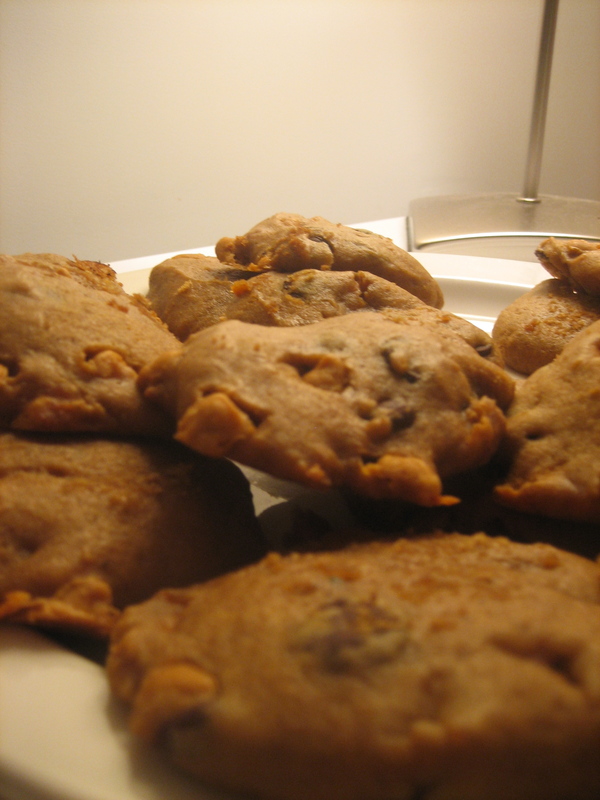 These are pretty basic chewy pumpkin cookies that have butterscotch and chocolate. According to my roommate, the butterscotch and pumpkin go really well together – or as she put it “it’s like they’re copulating in my mouth”. Pumpkin cookies tend to be a little moist because pumpkin purée is so wet, so I highly recommend spreading them out on a large plate rather then trying to stack them as they will stick to each other. 1) Position a rack in the middle of the oven . Preheat the oven to 325 degrees F. Line two baking sheets with parchment paper and butter the paper. 2) Stir the flour, baking powder, baking soda, salt and cinnamon together in a medium bowl and set aside. 3) In a large bowl, using an electric mixer on medium speed, beat the eggs and sugar until smooth and lightened in color, about 1 minute. Stop the mixer and scrape the sides of the bowl as needed during mixing. 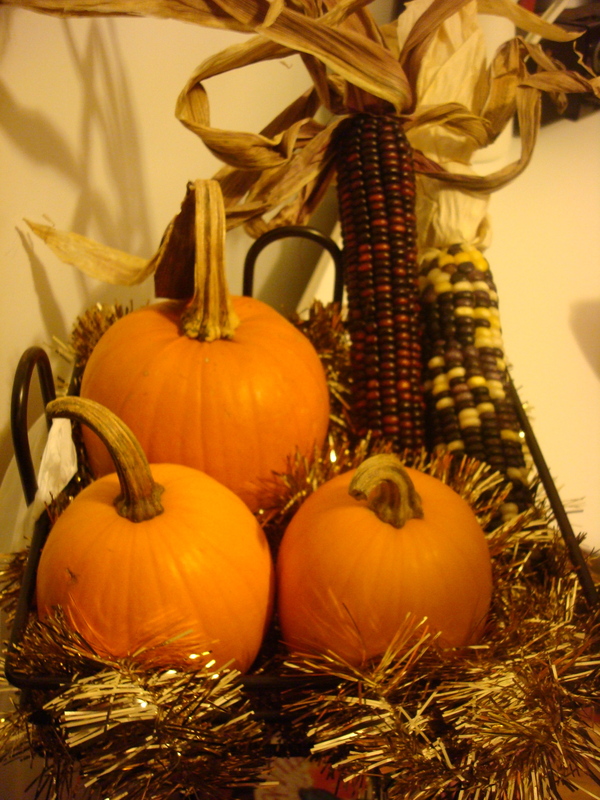 4) On low speed, mix the oil, pumpkin, and vanilla until blended. 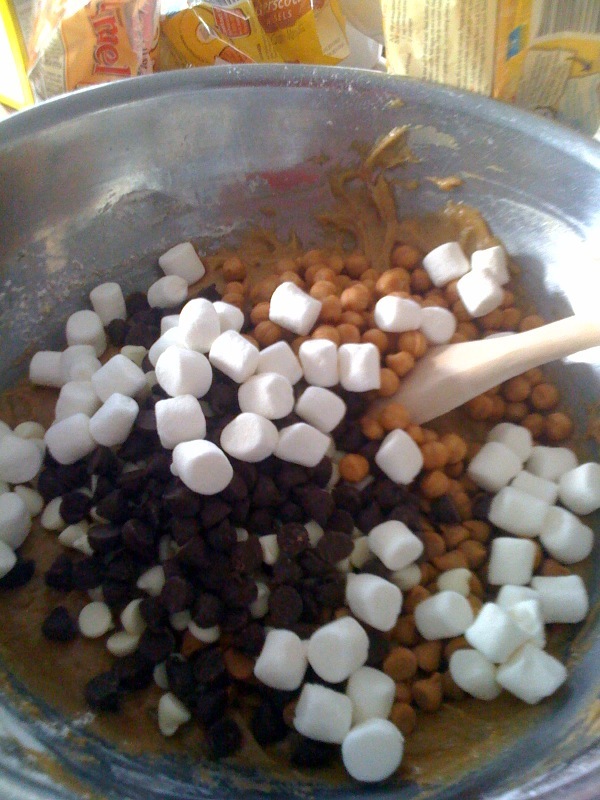 Mix in the flour mixture to incorporate it. Mix in the chips. 5) Using an ice cream scoop with a 1/4-cup capacity, scoop mounds of the dough onto the prepared baking sheets, spacing the cookies at least 2 1/2-inches apart. 6) Bake the cookies one sheet at a time until the tops feel firm and a toothpick inserted in the center comes out dry, about 16 minutes. 7) Cool them on the baking sheet for 5 minutes, then use a wide metal spatula to transfer the cookies to a wire rack to cool completely. So I’m back to baking in my tiny little dorm room kitchen. I guess I can’t really complain given that most dorms don’t even have kitchens, but after the luxury of using my oven back home last weekend, I guess I still feel a little bit spoiled. That being said, I’m super happy to be back in NYC. I had a great time in Israel and North Carolina, but it was still so nice coming back and seeing my roommate and suite-mates. Classes are back in full swing and I’m already swamped with homework even in the first weekend. That being said, Friday night we still had to have a bit of fun 😉 We had a big game night – mostly involving cranium and a super intense game of charades. There were about 11 of us and we all had loads of fun. I decided to make rocky ledge bars for our little soiree. I was almost going to make cupcakes, but then realized that those were way too involved for the hour I had designated for baking on Friday afternoon. They were super easy to make – although the brown sugar we had was rock solid and I had to spend 15 minutes softening it up in the microwave – but otherwise it was basically just dumping a bunch of chips, caramels, and marshmallows and a bit of cookie dough and popping in the oven. 2) Whisk together flour, baking powder, and salt in a medium bowl. 3) Using an electric mixer (I used a wooden spoon, since I didn’t feel like taking out the mixer), mix butter and brown sugar until fluffy, about 2 minutes. Add eggs and vanilla; mix until well combined. 4) Mix in flour mixture until combined. Fold in half of each of the marshmallows, chocolates, butterscotch chips, and caramels. 5) Spread batter in prepared pan. Scatter remaining marshmallows, chocolates, butterscotch chips, and caramels on top. 6) Bake until top is golden brown and a cake tester inserted into the center comes out clean, about 35 minutes. 7) Let cool on a wire rack. Lift out of pan, and transfer to a baking sheet. Refrigerate until set, at least 30 minutes. 8 ) Remove parchment, and cut into about 16 triangles. Bars can be stored in an airtight container at room temperature up to 1 week.